Data Capturing Unit - Unitech PT630D - The PT630D Mobile Computer is designed to meet your demands in various applications. Rugged and durable, yet weighing less than 250 grams, the PT630D is easy to handle. 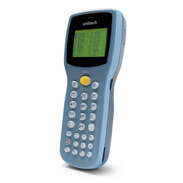 The flexible modular design including bar code reading and keypad input makes the PT630D a perfect multi-functional mobile computer for most data collection applications.